Did you know that your Organisation could loan one of our fleet of safe, reliable accessible vehicles. 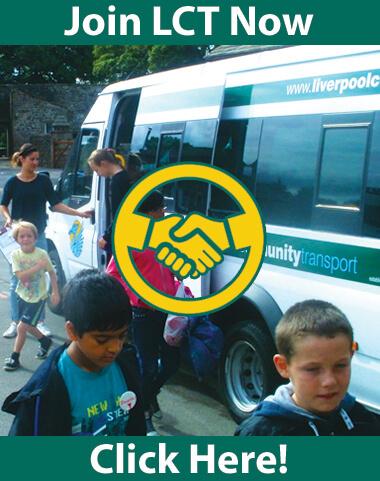 To use one of our minibuses you need to be a member of Liverpool Community Transport. Memberships costs from £15.00 per year. Our 17 seat minibuses are available with a volunteer driver or for maximum flexibility and lowest cost to your group vehicles can be hired on a self drive basis. Drivers should hold a full driving licence with D1 category, be over 25 years old and provide us with details of any medical conditions. If you don’t have your own driver, don’t worry. We can arrange for one of our DBS checked, fully qualified, experienced drivers to transport you, giving you total peace of mind. The cost is based on the individual details of each trip – please see our Minibus General Hire Information page for further details on what information is required. Further procedures are in place to check licence information before each trip; this will be discussed when booking the vehicle. All our vehicles are fitted with safety restraints, fire extinguishers, a first aid kit and where applicable, wheelchair clamps. If your vehicle breaks down we’ll aim to have a replacement with you as quickly as possible. Our RAC coverage ensures you’ll soon be back on the road. User groups are liable for the first £500.00 excess insurance against any accidental damage to the vehicle, Groups will also be liable for full cost of repair against any willful damage to the vehicles interior seats, seatbelts, linings etc. Only drivers registered on Liverpool Community Transport’s insurance are allowed to drive the vehicles. All bookings must be confirmed by letter or email. Liverpool Community Transport must receive notice of cancellation at least 7 days before the booked journey. The full cost of the booking will be payable if this notice is not received. User groups are responsible for returning the vehicle in a clean and tidy condition. A charge of up to £20.00 will be made if the vehicle needs cleaning on return. Food & drink is not permitted on any vehicle. Liverpool Community Transport will not be held responsible for any lost or damaged property. Personal belongings and valuables must not be left in an unattended vehicle. Small hand luggage (eg School Bags) is permitted inside LCT’s minibuses. Under no circumstances should large baggage be placed inside the vehicle. The use of the safety equipment on the vehicle must be reported on return. All vehicles must be returned with the same level of diesel as when signed out. Any group or organisation who has not replaced the diesel will incur a charge for the replacement and labour. Liverpool Community Transport will make every effort to ensure that bookings are fulfilled, we cannot accept any responsibility for bookings that are cancelled for reasons beyond our control.